This story has now been picked up by the Daily Mail Online! To read the piece follow this link. 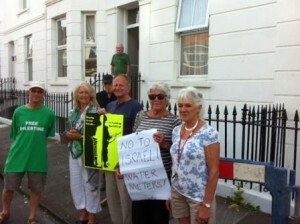 A Brighton resident and BHPSC activist has persuaded Southern Water to install an alternative water meter at her home, having earlier refused to allow them to install an Israeli-made one by sitting in a hole in the pavement and refusing to move. BHPSC has been campaigning locally to stop Southern Water from installing Israeli-made water meters in thousands of homes in Sussex. The meters are made by Arad Technologies – an Israeli company that profits from, and is deeply complicit in, the illegal Israeli settlements in the Palestinian West Bank. We have been challenging Southern Water to explain how a company (Arad) that is so blatantly involved in ethnic cleansing and the appropriation of Palestinian water resources can have been awarded this lucrative contract, when the procurement process clearly contravened several of Southern Water’s own ethical and corporate responsibility policies. You can find out more about the campaign here. Last month, Caroline and Edmond O’Reilly caused a bit of a stir by refusing to allow Southern Water to install the Arad meter at their home in Kemp Town in Brighton. The story was picked up by the Brighton Argus. Southern Water became “deluged” with phone calls and letters of complaint, and representatives of the company faced determined questioning at local meetings. The Member of the European Parliament for the Southeast, Keith Taylor, challenged the CEO of Southern Water in a series of high-profile exchanges of letters. Taylor’s letter – CEO’s reply. Following Caroline O’Reilly’s refusal to allow the Arad meter to be installed, she exchanged letters with Southern Water staff, resulting in a significant climb-down by the company. Having previously insisted that the installation of the Arad water meter was compulsory and non-negotiable, the company then acknowledged the principled position she had taken up, and offered her an alternative meter – one that was not made by an Israeli company. On Monday July 22nd, to the cheers of pro-Palestinian activists living nearby, Southern Water duly arrived at the O’Reilly’s house and installed the alternative water meter. Caroline O’Reilly’s doggedness in the face of Southern Water intrasigence really paid off, giving hope to supporters of justice for the Palestinians across the city, who intend to follow suit by asking Southern Water to install an alternative water meter at their house rather than collude with the company’s disgraceful partnership with Arad Technologies.